Love it thus far. Easy to setup and was a lot less weight than the old Harmon. Item arrive in perfect condition as described. Shipped in a timely manner. Super Fast Shipping. Item as described. Thanks! Canceled order 24hrs before it left their doors. Still shipped. It is a very nice and strong receiver. After some time I felt I needed a new one. It is very light weighted, which is just fine for my glass console and the connection to my sub-woofer incl the loud speakers cubes was easy to complete. The sound is just great and I a have a feel of ease, that this Harman Kardon will last for a very long time and give me nothing but joy. Unfortunately the remote control has a problem. sometimes it works sometimes it doesn't. That's why I can only give 4 stars. This is the first Harmon product I've purchased. I've heard good and bad about them, but the AVR 1610S had every option I was looking for in a receiver. After a few weeks of use I am very satisfied with my purchase. The sound quality is great and the 1610s was a breeze to set up. I would definitly recomend this AVR if your looking for an easy to use, feature packed AVR with quality sound at an affordable price. I am using it for my 5.1 home theater setup. It was easy to connect with everything, and the bluetooth feature works surprisingly well with both my phone and my PC. The display is a little small, but it is no issue once you know what to look for. I'm an old dinosaur and this unit is complicated. I'm slowly learning to operate it, though. I 'm used to knobs and buttons, not on screen menus and remote contr mools. Sounds pretty good though, and seems abt the right size to drive my small B&W's, which is what I bought it for. I look forward to getting a 5.1 set of speakers for it. 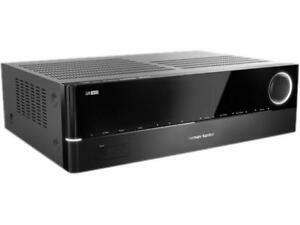 A very good quality Harmon kardon receiver. Setting up was a bit more complex for an average user. Bluetooth works and pairs easily but you'll need to dive into source select which can be a hassle. 4k connection remained working with no lag. Great product to buy for the price.